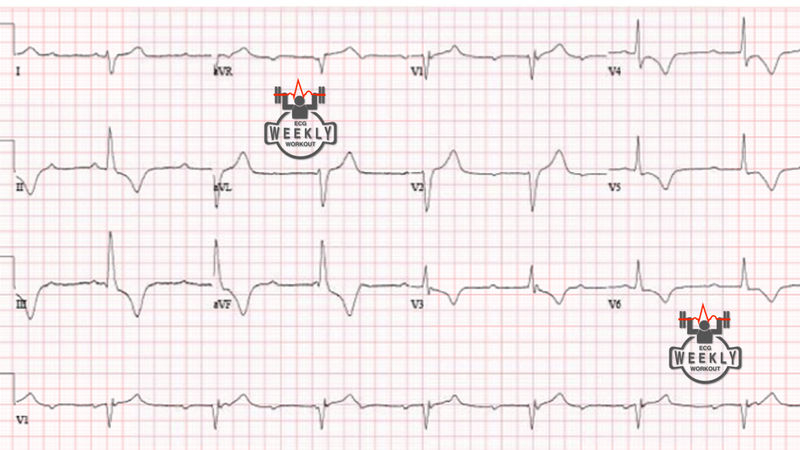 This week we review the answers to questions 7-14 from the 5th annual UMEM Residency ECG Competition. Make sure to attempt to answer the questions before clicking the red box to reveal the answers and teaching pearls! Large pulmonary embolism! There is right axis deviation, sinus tachycardia, ST-segment elevation in aVR, and T-wave inversions in anterior and inferior leads. Pay attention to axis, as right axis deviation can help distinguish massive PE from STEMI. Treatment for hyperkalemia. The QRS is too wide and ventricular rate too slow to be ventricular tachycardia. Sinus tachycardia with complete heart block and junctional escape rhythm, left posterior fascicular block with inferior-lateral ischemia. Regarding question 12, can you comment on the significance – if any – of the change in the QRS morphology occurring along the lead II strip? It seems the first P-wave leads to a slightly different QRS morphology than subsequent conducted P-waves. What is the physiological basis for that consistent change in QRS morphology? Is the intraventricular conduction delay in question 12 a LPFB? Small q inferiorly, possibly small r aVL, then R waves inferiorly with S in aVL and probably I (but hidden by the reciprocal ST depression). The RWP in aVF looks delayed, and the axis is inferior… Does it meet criteria? Question 14. Playing devil’s advocate… Don’t you need to exclude other causes of RAD before settling on the rare diagnosis of an isolated LPFB? RAD + S-wave in I, +aVR STE (the only fully seen complex appears to have this), and inferolateral TWI/ST depression. This sounds a lot like RV strain. PE? Other cause of pulmonary HTN? Other cause of RV strain? There appears to be a little positive deflection at the end of the QRS in V1 and V3… Epsilon wave? There is only TWI in V3 to fit with this, but there is a prolonged S-wave upstroke in V2 and borderline wide QRS complexes. The patient presented with syncope… so both AVRC and PE fit the stem… Thoughts?